Our range of soils include: Earthgrow Compost, Garden & Organic Soil Blends, Lawn Top Dressing, Turf Starter mix, Potting Mix and Gypsum. A general purpose soil mix based on selected Toowoomba red soil and blended with compost, ash, sand, minerals, gypsum and nitrogenous fertilizer. This soil is manufactured to Australian Standard AS 4419 and is suitable for most garden landscaping applications. A lightweight soil blend with a high organic matter content manufactured from natural scrub soil, sand, compost, ash and nitrogenous fertilizer manufactured to Australian Standard AS 4419. Suitable for a general purpose garden soil, raised planting areas or large containers. A rich blend of fine washed sand (less than 2 mm), steer manure and scrub soil with a very high water infiltration rate. Recommended depth of 2-5mm, do not smother leaves. This product is made to plant lawn seed or to lay turf onto. A coarser version of the Lawn Top Dressing. This mixture comprises fine sand, loam, compost and ash. Use to a depth of 50-100mm. A high quality growing medium manufactured from composted bark, sand, coal ash and matured compost to Australian Standard AS 3743. Suited to larger containers than premium mix due to the addition of compost. Generally a lower water holding capacity. A fully composted blend of screened cow manure, aged bark fines and a variety of other organic materials. It is designed to be dug into existing garden beds or added to clay based or sandy soils to improve the overall quality. pH neutral, this compost mix can be used with confidence around all plant types as it will not burn or damage the root system. 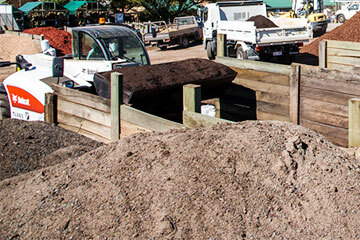 Our soils and potting mixes are the highest quality mixed in Toowoomba for local conditions. We have two special garden soils, two lawn top-dressings and two lawn under turf soils. Our popular potting mix is sold in bulk or in 40 litre bags. How much do I need for my garden? 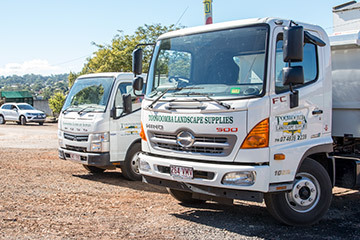 Take a look at the Delivery Service › available from Toowoomba Landscape Supplies. Contact us for further information on our lawn, soil, or potting mixes.